Missouri has significantly more transportation needs than money available. MoDOT works with its planning partners, transportation stakeholders and the general public in deciding the highest priority needs and improvements that should receive available funding. This process, referred to as the Planning Framework, relies on the right people being involved in discussing and evaluating needs and then making decisions on which ones should move forward. We are committed to working with local officials, citizens and stakeholders to help determine the right transportation solutions for their communities. MoDOT recognizes that a transparent, inclusive and flexible process provides the best results. Missourians have a say in how transportation dollars are spent. The most common way for citizens to be involved is through public meetings that MoDOT, metropolitan planning organizations (MPO) and regional planning commissions (RPC) hold throughout the planning and project development processes. These meetings are held in communities around the state specifically to gather input from the general public. 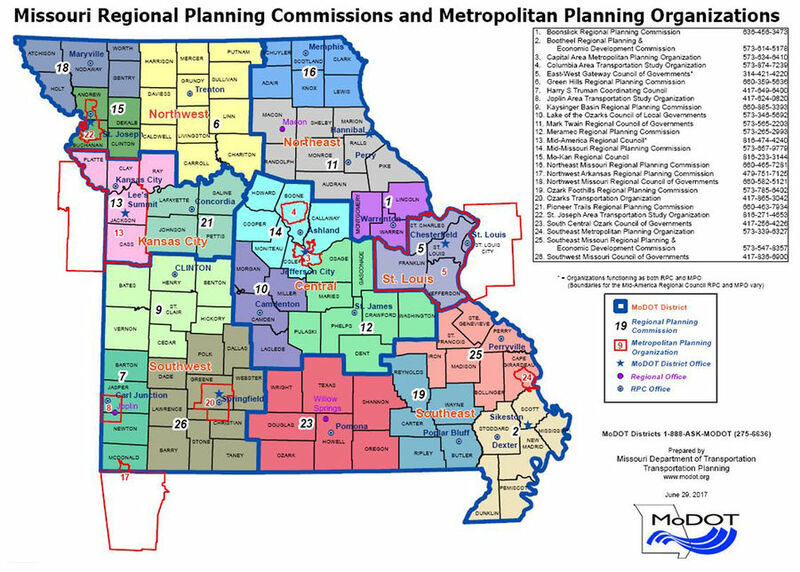 Missourians are also involved by electing the local officials who comprise the RPC and MPO boards of directors and/or through direct contact with MoDOT, MPOs, RPCs or local officials. While all the public is invited to participate in our process, particular care is paid to contacting property owners adjacent to the specific solutions, public officials, elected representatives, law enforcement, schools and emergency services regarding needs and proposed improvements. Innovative methods to involve minority and economically disadvantaged sectors of the community, as well as other groups (senior citizens, economic development interests, and historical and environmental groups) are also used. The development of quality transportation improvements depends on early, often and continuous involvement of the public in decisions. Public involvement allows MoDOT to gather real, valid input on transportation needs and to work with customers to refine solutions that meet those needs. The Planning Framework is a mix of objective and subjective data and criteria used to help prioritize regional needs. The objective data can include items like traffic volumes, accident statistics, travel times and condition reports for the transportation system. Subjective data can include local safety concerns, local perceptions for economic development opportunities, cost and resource sharing and other items. MoDOT, MPOs, RPCs, public officials, special interest groups and citizens set and refine Missouri’s transportation vision in the Long-Range Transportation Planning process (LRTP). The vision is Missouri’s ideal transportation system based on feedback from Missourians. The LRTP process provides information, guidance and direction to MoDOT and its planning partners and stakeholders to help identify the needs and determine where Missouri’s transportation dollars should be spent. In addition to the statewide LRTP, MPOs develop regional LRTPs that include policy development, fiscally constrained needs identification, public involvement and conformity with air quality regulations. In general, items in MPO and state LRTPs are consistent. Resources will be allocated to the needs and projects agreed upon by both the MPO and MoDOT. Once a draft LRTP is developed and presented to the Missouri Highways and Transportation Commission (MHTC), MoDOT accepts public comments during a 30-day period prior to submission of a final LRTP for approval by the MHTC. High Priority – Resources address these needs first by selecting them to develop/design specific solutions. Medium Priority – These needs may be addressed as additional resources become available. Low Priority – No work for these needs at this time. Forecasting the improvement’s delivery schedule. The scoping process helps determine the most complete, cost-effective improvements early in project development. 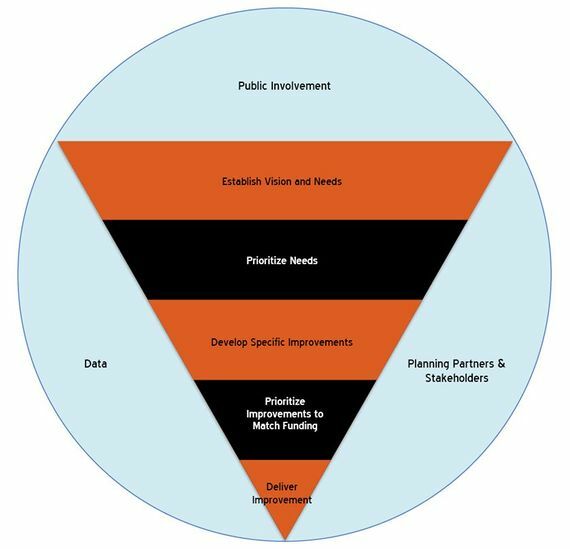 Public involvement in defining the needs and determining the appropriate improvement can take several forms. The public may actually initiate the investigation of needs by contacting MoDOT or its other planning partners. The public, through local officials, is represented in the scoping process. After viable improvements have been identified for high-priority needs, the needs move on to the improvement prioritization process. Annually, MoDOT works with its planning partners to establish a prioritized list of transportation improvements, using a prioritization process determined by each region. The improvement prioritization is fiscally constrained based on each region’s available funding. Each time improvements are prioritized; existing improvements not yet scheduled for delivery will be re-evaluated. Some high priority improvements may never be delivered due to prohibitive costs, changing priorities or other reasons. If MoDOT and its planning partners unanimously agree that an improvement no longer addresses a valid need, it will be removed from the priority list, freeing resources for other improvements. MoDOT, MPOs and RPCs determine which high priority transportation improvements should be funded. The improvements that are selected for funding are included in MoDOT’s five-year Statewide Transportation Improvement Program (STIP), and also in each MPO’s Transportation Improvement Programs (TIPs), where applicable. The STIP and TIPs set forth the specific transportation system improvements that will be completed during a four- to five-year period. STIPs and TIPs are rolling plans; as one year is completed, another year is added. Each year, the Draft STIP is presented to the MHTC in May, followed by a 30-day public comment period. A final STIP is taken to the MHTC for approval each July. Once an improvement is added to MoDOT’s STIP, it is a commitment and will be delivered. Regulations require the state to provide for non-metropolitan local official participation in the development of the long-range transportation plan (LRTP) and the statewide transportation improvement program (STIP), and to develop a documented process for consulting with non-metropolitan local officials. MoDOT consults with metropolitan and non-metropolitan planning agencies on substantive changes to the LRTP and other statewide transportation plans and programs as required by 23 CFR 450.120(b). MoDOT conducts an annual partner survey to collect satisfaction data from transportation planning partners. These surveys are sent across the state including but not limited to MPO, RPC, elected officials and municipal employees. MoDOT encourages its planning partners to give open and honest feedback in order to find ways to continually improve partnerships and processes. The results of the survey are compiled into a comprehensive report that measures the overall satisfaction and feedback received from all survey respondents. The survey, administered online, is open for a 30-day period. Limited transportation access, childcare necessities, work schedules and language barriers are just some of the hurdles that keep traditionally underserved populations from attending workshops and focus groups. MoDOT plans to provide meaningful public involvement opportunities to minority and low-income populations. Effective strategies aimed at minority and low-income communities include actively engaging members at community gathering places, advertising in ethnic media, providing outreach materials at transit facilities and communicating through trusted community leaders. In all cases, we must clearly show how the LRTP and the STIP are relevant to minorities and low-income populations. Another approach toward reaching traditionally underserved groups is to build upon existing MoDOT outreach efforts. MoDOT recognizes that to reach a broad spectrum of the public, we must employ a wide range of outreach techniques. The public outreach toolbox detailed here, lists some of the many tools that we have used to engage the public. In addition to these tools, on an as-needed basis, we also will provide language assistance to participants whose first language is other than English, provide documents in alternate formats to those with sensory disabilities, and provide disability assistance at workshops/public meetings. We also strive to make workshops and focus groups as open to as many people as possible by choosing easily accessible locations and accommodating nontraditional work schedules. The following techniques are potential outreach methods that may be used during the LRTP and STIP public participation process. Actual outreach methods for a particular LRTP and STIP public involvement activity will be determined based on available resources, time constraints and applicability. As the public engagement process progresses, a schedule of public participation activities will be posted on the MoDOT website. Stakeholder and general public focus groups are an effective method for gathering attitudes, opinions and ideas to help formulate transportation policies and plans. Focus groups can be established by affiliation, ethnicity, income, mode of travel, age group, traveling conditions and other specific categories. For ease in updating, a stakeholder database will be focused on statewide or district-level groups, whenever possible. Using this strategy leverages the power of the Internet by creating a “web-tree” of partner organizations that are willing to pass along information and invitations to comment on the LRTP and STIP to their constituencies. Because it is often difficult to get the attention and comments from those who are traditionally underserved, such as minority and low-income groups, special efforts should be made to include a broad and diverse set of community-based organizations serving those populations. While web-based communication and social media have become commonplace, other media still holds a valuable role in public engagement. News releases, flyers and postcards can be used to publicize the public participation website, important planning milestones, workshops, etc. News releases can be widely distributed through newspaper ads, public notices, radio and television. Ethnic media provides an excellent forum for reaching those traditionally underserved in the planning process. For some groups, especially community-based and advocacy groups, presenting at established meetings is the best outreach approach. Web-based technology has opened up a whole new range of techniques for reaching out to a large and geographically dispersed population. This is especially important to the LRTP and STIP outreach activities, because these programs face the challenge of engaging the public and stakeholder groups throughout the state. Podcasting, webcasting, blogging and web-posted videos are a few of the techniques that may be employed to channel the power of technology to reach a broad and diverse audience. This page was last modified on 4 January 2019, at 13:48.